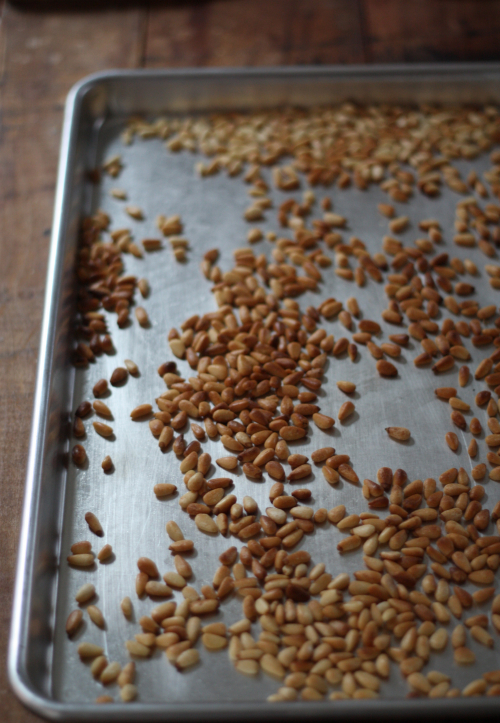 If you've wondered where pine nuts come from I have a news flash for you — Pine Cones! These edible nuts are mainly cultivated in Asia but you can find them in Europe and even North America. When you head to the store, for the most part they are of an Asian variety. If you have purchased these recently they probably hit your wallet pretty hard — depending on where you get them, you can spend upwards of $5 for a mere half cup. I have been cooking with pine nuts for years and have always had a particular way I preserve them as soon as I unpack the nuts from the grocery bag. I lay the raw little nuts (subliminal advertising in the picture above) on a baking sheet, set the oven on a low broil, and then toss these babies in until they are toasty and golden brown. 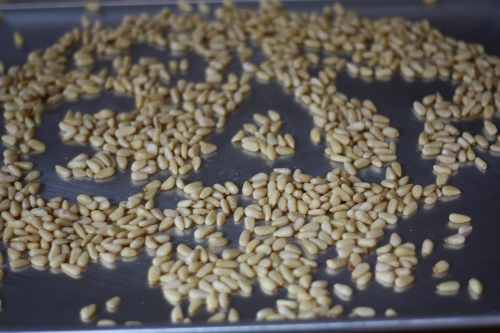 Pine nuts are like any other nut — they contain oil, which means you have to keep an eye on them in the oven. Shake the pan or stir with a spatula to evenly brown all sides. Trust me, in a few seconds these can go from golden brown and edible to charred black — headed for the compost bin. Once browned, remove them from the oven and allow to cool. Seal in an airtight container or freezer bag and keep them in the freezer. 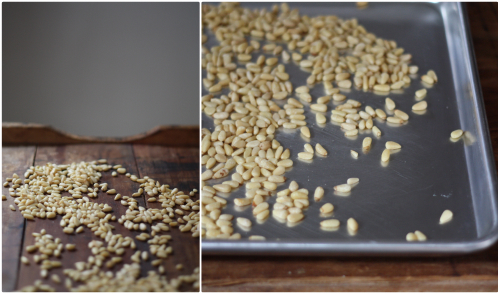 You will then have freshly toasted pine nuts always ready to go for salads, pestos, and greens dishes! 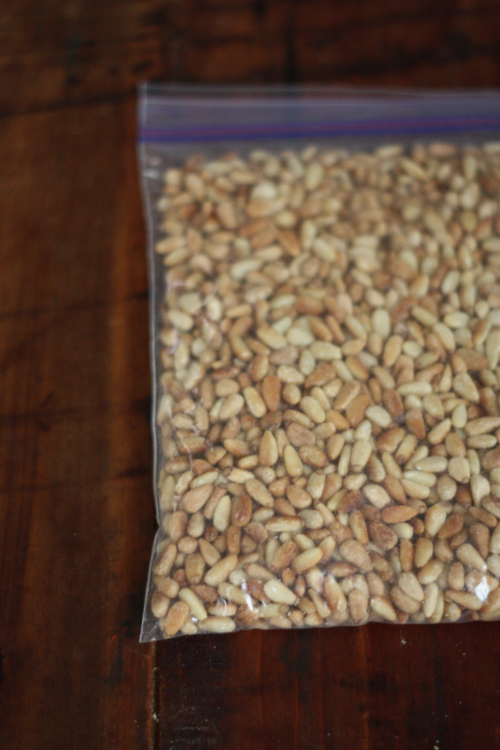 Most people will tell you that raw pine nuts will last in the refrigerator 1-2 months and in the freezer 3-6. With toasting the nuts I have extended the shelf life easily beyond 6 months and have enjoyed them upwards to a year! 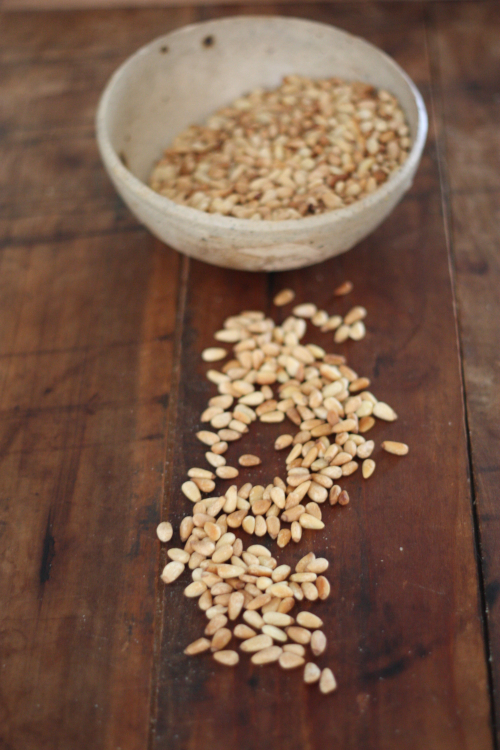 If you haven't cooked with pine nuts in the past, I hope you will use this method to extend the shelf life and explore dishes that let this little nut shine! 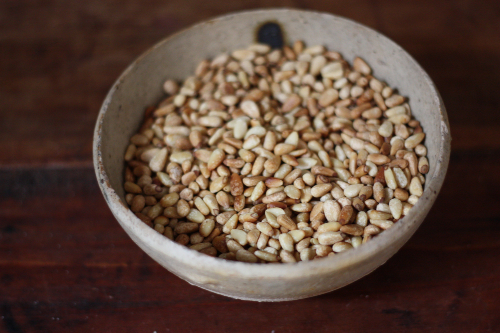 When I could still eat nuts (allergic to them now), pine nuts were always at the top of the list. And they always ended up getting toasted, as that's easily the best way to enjoy them, but I never thought of toasting them all beforehand! What a great timesaver...although I must say, no matter how many or few pine nuts I bought, they rarely lasted very long! I am with you Pamela they do not last long here either! That is exactly how I have been preserving mine, too. Except I roast mine in a pan on the stove and mostly use them in pesto or pistou as it is called in Provence (same thing minus the parmesan). Hope things are well in Provence as I see you are getting ready for Spring! Finally had some time to catch up on your posts. Lots of goodies to remember. 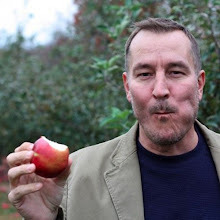 Will this work for almonds too?